Posted by jkahane in diabetes, health hut, personal, test results, tests. Got home about half an hour ago from the Diabetes clinic and my regularly scheduled six-month appointment. I managed to get to the hospital around 1:00 pm for the 1:10 pm appointment, and was told that the doctor was running late. One of the nurses who works there took my vitals, and the only real surprise was the fact that my blood pressure was somewhat elevated. Not surprising, given the stress(es) I’ve currently got going in my life. My weight was holding roughly the same (and no, I’m not going to say how much I weigh, but I could still stand to lose a few more pounds), and otherwise everything else is status quo. The appoinment with the doctor went pretty much as I expected it would, but he surprised me by saying that he doesn’t think several of the medications are doing me much good these days. My a1C level was down a bit, my cholesterol levels were nicely down (within normal levels) and my triglycerides were still a bit high, but better than they’ve been. He wants me to go back to a meal time insulin that I had taken for a while (but which gave me little red rings around the injection points) and to stop taking the Lantus, the Glumetza (metformin), and the Diamicron. I told him that I’d give this a lot of thought, and I’d be in touch with the diabetic nurse about what I’ll be doing and keeping track of things. Lots to think about. Went over to Harvey’s for lunch and had an Angus burger, some onion rings, with some water, and then caught another taxi home. Came in and just put my feet up and relaxed for a bit (may have taken a nap). Posted by jkahane in food hut, grocery shopping, health hut, personal, test results, tests. I went for my doctor’s appointment at 1:15 pm, and got the results of my MRI on the left shoulder. After waiting about 10 minutes to see the doctor, he came in and we discussed my general health (I would rate it fair to middling at this point), then got down to business. The MRI came back as normal, with the exception of some inflammation in a couple of places, but nothing that would account for the pain that I’ve experienced the last two years or so. He told me that he’s going to make an appointment with a specialist (one that’s already in the works, but could take a maximum of 18 months to get, as they’re very much in demand these days), but that in the meantime I should go back and continue my physiotherapy. So that’s what I’ll be working towards this week, but with the long weekend coming up and Canada Day and everything ahead, might not be ’til some time next week. From the doctor’s office, I went and had some lunch at Tim Horton’s, and then went to do some grocery shopping for some veggies and a few other necessities. And, of course, wouldn’t you know it but I moved the left arm the wrong way or lifted something too heavy with it or whatever, and *SNAP! * just like that, I had excruciating pain in the left shoulder and down the arm, and my neck started hurting. I drove the car and got home from the shopping, and managed to put things away, and then lay back for a bit and took some pain killers. Time to start thinking of supper now, though I’m not sure how long I’ll be able to stand in the kitchen and make the food. Some water to drink first before anything else, though. Posted by jkahane in health hut, personal, photos, test results, tests. For those who may have noticed, I did not game yesterday (Friday) evening. The reason for this is that I spent much of Friday night and all of Saturday morning in the hospital. I started feeling pretty bad on Friday (the 13th!) with very bad lower abdominal pain and bleeding down below. That’s when I decided that I’d get myself over to the Ottawa General Hospital. Took a cab over. I got to the hospital around 9:25 pm. Managed to get through triage relatively quickly and was feeling pretty meh. Couldn’t sit in a chair properly, so found an empty seating area (relatively speaking) and stretched out as best I could. 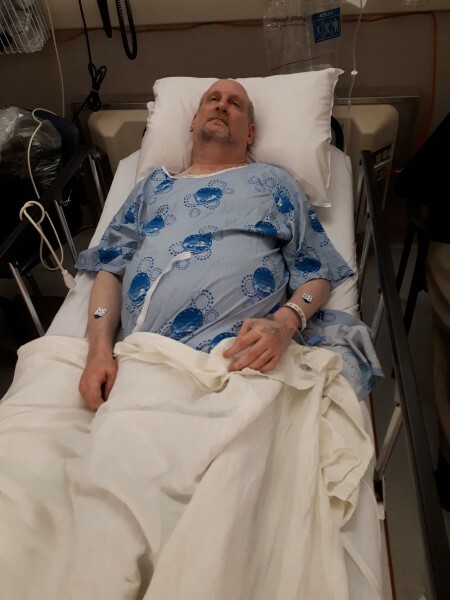 Several hours later, I was admitted into the Observation wing, and after hooking me up to an IV and taking blood samples and some other tests including my favourite (the DRE) NOT!, I was told that it might be diverticulitis and was scheduled to have an abdominal CT scan. They hooked me up with a saline solution to hydrate me, since I wasn’t allowed any water (chips) or food, and also gave me a shot or three of Delaudid for the pain. The nurse who was keeping an eye on me took a photo around 1:10 a.m..
All I remember at the time of the picture taking is that I was seriously uncomfortable from the pain, and really tired. Couldn’t sleep, ’cause I couldn’t lie on the bed for long periods of time because of the back and shoulder issues. I had the abdominal CT scan around 7:20 am today. They injected a dye that made me warm all over, but the CT scan lasted all of 1 minute, 30 seconds, and then I was left on the bed for the trip back over to Observation for 25 minutes. It was very cold in the hallway. Anyway, the good news is that I don’t have diverticulitis or any form of cancer down there. Not going to go into any detail about what’s happening with my bowels and the like, but a treatment has been prescribed, and now I just deal. Got home around 11:50 a.m. this morning. Hunger warred with a desire for sleep, and food won out. Then went to bed and slept for several hours. Taking it easy the rest of today. Have to wait and see what tomorrow brings. Posted by jkahane in health hut, personal, test results, tests. Just got home from the appointment with the doctor. This appointment was the follow-up to the previous appointment, and the second MRI that I had done last week. The MRI(s) results were…not good. I’m still coming to terms with the results, and their implications for me. In the meantime, I’ve got to see a specialist to decide what to do about the (major) problem that has come up. I have to call the specialist tomorrow to set up an appointment to see him. Meanwhile, the back/shoulder/arm/neck pain continues to worsen. Nothing more to add at this point. Posted by jkahane in conventions, diabetes, doctor, gencon, health hut, personal, test results, tests. I have just gotten back home after seeing the doctor. When I went to the doctor’s office for the appointment at 1:10 pm, I got there late as I had problems dressing my foot wound and getting a taxi over to his offices. I saw him around 1:45 pm, and after assessing my wounds he told me to get over to the Ottawa General Hospital, as my blisters were pretty bad, but there was more trouble. He gave me a letter to give to the triage nurse and doctors at the hospital, so I grabbed a cab over there. At the hospital, it took roughly 2 or 3 hours to see the doctor, and she confirmed what was going on: The neuropathy in my feet has progressed and all the walking I did (too much, apparently!) at GenCon 2017 caused the blisters, but also a relatively bad case of cellulitis in both feet. The doctor prescribed treatment for me, told me to take it easy and off my feet as much as possible, and that hopefully the antibiotics (yes, there are two of them!) will clear things up in 10 to 15 days. Both doctors told me that my days of walking that kind of distances and to the extent that I did at GenCon 2017 are over. The progression of the diabetes and the foot neuropathy are things that happen to pretty much all diabetics, and one just goes on from there. Posted by jkahane in food hut, health hut, personal, physiotherapy, test results. I feel pretty good this morning, but the left shoulder and the area there are hurting pretty bad. Probably due to the “exercise” it got yesterday. Speaking of which, I had my physiotherapy assessment and first treatment yesterday afternoon. I managed to get to the appointment barely on time (they only do assessments at certain times, so if you’re not on time, they may not be able to take you) due to a snafu with ParaTranspo that had me end up taking a taxi to the appointment. Once checked in, the assessment took something like 45 minutes. The verdict is that I tore the upper back muscle that connects to the shoulder and rotator cuff some 5 months ago, and it has not healed properly (likely due to overuse). In addition, there’s a lot of edema and damage to the shoulder and muscles around the joint. Physiotherapy will help it a lot, but the physiotherapist discouraged me from getting a steroid shot in the shoulder, as she didn’t think it would help (since there’s no real problem with the shoulder socket itself). After the appointment, I had a really good lunch at the coffeeshop/cafeteria in the building: a nice bowl of hamburger and veggie soup with a roast beef and havarti wrap. Filling, and satisfying. After that, I went home and did some work on stuff that I’ve been meaning to do. My only complaint today is the fact that my shoulder is hurting like hell, as mentioned above. Meds and some tidying around the house and a bit of reading will help. I hope. Posted by jkahane in doctor, health hut, personal, physiotherapy, test results, tests. I had my doctor appointment yesterday to find out what the results of the x-ray and shoulder ultrasounds showed. The appointment was for 2:15 pm, but I didn’t get in to see the doctor until close to 2:50 pm so it was a relatively long wait in the office. Once inside, the nurse weighed me. I was pleased to see that I hadn’t gained any weight, but I hadn’t lost any weight either. Suffice to say, the test results were all negative. As far as he could tell, there’s nothing wrong with my shoulder, but he can see the pain’s real and that I have little movement in it, and there’s a good amount of swelling around it. Since it could be something to do with vertebral discs, he’s going to set up an MRI of my upper spine and the area, and see what that shows. In the meantime, he suggested (very strongly) that I go have some physiotherapy on the shoulder to try and get some of the mobility back and strength built up there. In the meantime, I’m in a lot of pain there. And it’s affecting the use of my arm quite badly at the moment.